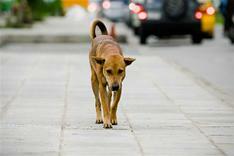 Why are stray dogs a problem? may foul public places or other people's property. Any dog which is out with it's owner's property without a keeper is considered to be a stray.If you see a stray dog you should contact the Animal Welfare Officers at Environmental Health (Monday - Friday 8am to 3pm). Out with these hours contact your local police station. Please note that on occasion the Animal Welfare Officers may be unavailable in which case you have the option to take the dog to the nearest manned police station. (Police Scotland has no duty to collect stray dogs, but must accept any handed in at a police station). If you feel comfortable and the dog is friendly try putting the dog into a secure area. This will prevent the dog causing, or being involved in a road accident until the officer arrives to collect the dog. Never risk being bitten. My dog has been uplifted - how can I claim it back? By law, stray dogs which have been taken to the kennels will be available for owners to reclaim for 7 days. After this time the dog becomes the property of the Edinburgh Dog and Cat Home. The charge for allowing your dog to stray is £25 plus £12.50 per day kennelling (from 1st October 2018). This amount is payable at the time you collect the dog. Under certain circumstances, your dog may be returned directly to you by the Animal Welfare Officer. In these cases, dog owners are liable to pay the £25 fee, which will be sent as an invoice to your address. All Stray dogs picked up by the Animal Welfare Officers or Police in West Lothian are held, on their behalf, by The Edinburgh Dog & Cat Home until they are either reunited or become the property of Edinburgh Dog & Cat Home. In order to prevent fraudulent claims, dogs will only be handed over to owners with proof of identification such as drivers license, passport, or credit card. I have lost my dog, how can I find it? Contact the Animal Welfare Officers to see if your dog has been uplifted. Your details will be recorded so that if we receive reports of a stray dog matching your dog's description we can contact you. You should also contact your local police station and report your lost dog to them, as police officers can also uplift stray dogs. Contact Edinburgh Dog and Cat Home on the details above. All dogs uplifted in West Lothian go there so by registering your details they too can contact you if your dog is handed in. If you have Social Media then it is recommended you post an appeal to some of the lost and found pets pages that can be found in and around West Lothian. This is an effective way of getting your dog's picture out into the public eye and get any witnesses to come forward. Contact the Scottish SPCA on 03000 999 999 and if after a few days if your dog is still missing you may wish to contact NETs, Land & Countryside Services in case your dog has been involved in a road traffic accident. If you do find your dog, please inform any service you have reported it missing to.